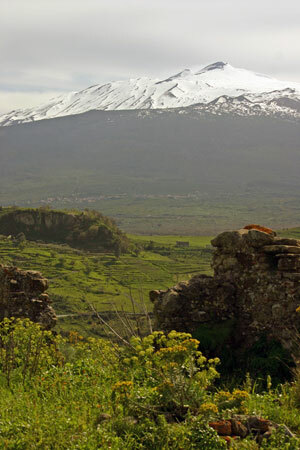 Our destination today is the south of Mt Etna. On the road you will see some typical towns like Santa Venerina, Zafferana Etnea. After one hour and an half ride, you will reach the “Silvestri Craters” located at 1850 meters. Possibility of nice walks on the cold lava rivers from the last three years. Eventually, you can purchase an optional trip to get almost to the top of the volcano (3000 mts): first you will take the cable-car up to 2600 meters, then you will board all-terrain vehicles that will take you to the foot of the main mouth after we will then visit a local family farm where we stop for lunch and we will try the Sicilian specialties after lunch we will have a tasting of wines return to the hotel at about 4.30pm. The town spread around the Priory of San Giacomo, founded in 1387 in the upper part of the Valle del Bove, the point of confluence of the lava streams from Etna's Eastern craters which frequently have destroyed the town, which has always been rebuilt. Zafferana Etnea was threatened by the 1992 volcanic eruption of Mt. Etna. It is now a summer resort with views of landscapes toward both the mountain and the sea. The second Sunday in August is the Festa of Madonna della Provvidenza. There is a festival of grapes, bottled fruit, mushrooms, honey, wine and chestnuts in October. Zafferana, along with Nicolosi, is now regarded as one of the major tourist stopping points for summer and winter expeditions to the summit of Mt. Etna.